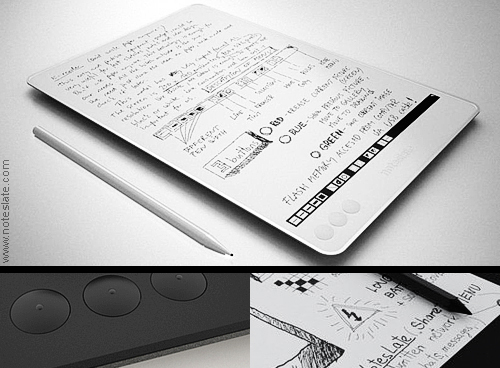 The NoteSlate is a low-cost 13” monochrome e-Ink tablet easily operated by a basic processor with ARM chip and 128 MB RAM memory at 233MHz. Resolution is 750 x 1080 pixels (100ppi. no anti-aliasing e-Ink resolution). 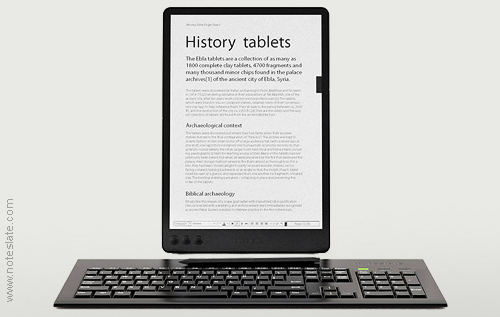 It comes with a stylus pen to sketch and write on it, and three hardware buttons to let you delete a page, save the current one (up to 70.000 pages), or view previous screen. Inputs and outputs are: USB, SD-slot, headphones and power. Wi-Fi connectivity is optional and battery life is about 180 hours. -Where does the pen go? Stephane, I think that the pen is going to be magnetically attached to the NoteSlate device. The 3 buttons should be configurable. As long as the software is Open Source, some of these proposals shouldn't be a problem, I think. The purpose of WiFi is to transfer files to other computers? Maybe, but you can also use the SD card to transfer data. Noteslate price is going to be 99$! That's the best!